If you’d like to test yourself for that big English or Chemistry exam, give BarCharts’ line of standard-size flash card boxed sets a try and you’ll see better grades in a flash! Each set features a series of cards with detailed problems, questions, or examples on one side and answers on the other. The flash cards are also color-coded so that finding specific sections is a snap. With their small format and portability, these boxed sets are perfect for anyone on the go. 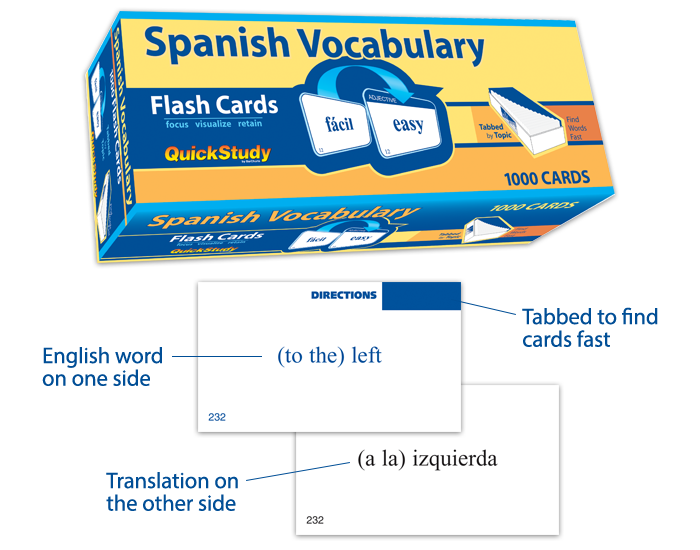 Find the topic you need to study by looking on the side of the flash card box. This will show you the location of that topic within the box. Once you find the area you want to study from the legend at the side of the box, locate that section of cards within the box. 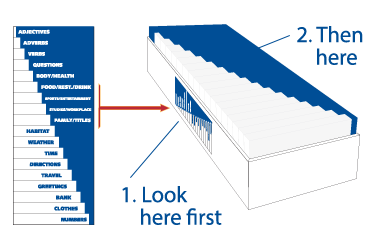 Notice how the blue starts small and then gets larger after each subject; this allows you to find the cards you need in a flash. Plus, all of the cards are numbered. Our premium Anatomy flash cards contain 300 full-color cards on 14 human anatomy (surface, skeletal, joints & ligaments, muscular, nervous, brain, senses, digestive, respiratory, circulatory, heart, lymphatic, urogenital and reproductive), with images on one side and label text on the other so that students can easily test themselves. Each card contains high-quality illustrations by award-winning anatomical artist Vincent Perez. There is nothing else on the market that compares in quality, number of cards, and price as our Anatomy flash cards.